Home / Products / Ageing & Repair / Counter A.G.E. 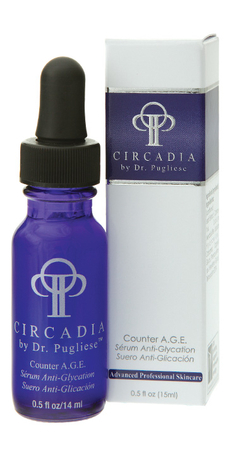 This light water based serum is specifically formulated to counteract the damaging results of unchecked glycation in the skin. Hyaluronic acid recruits moisture to the skin, while phytochemicals provide superior antioxidant and detoxification properties. Detoxifies skin from glycating agents and oxidants, protects biomolecules from the effects of glycation and glycationinduced inflammation, prevents cell loss from A.G.E.s and from increased sugar levels. Reduces DNA damage resulting from fenton reaction products and reduces metal-mediated A.G.E. formation. Inhibits mallard reaction and reduces A.G.E.s. Enhances collagen production, wound healing, and is antiinflammatory. Contains Aucubin, flavonoins, phenylethanoids, tannin and polysaccharides. Complex of Mexican bamboo (resveratrol), Boldline from the Boldo tree, aminoguanidine, and decarboxy carnosine prevents glycation and boosts Sirtuin 1 and 2. Complex of Bamboo silica, pea extract, and glucosamine increases collagen, elastin and hyaluronic acid synthesis. For best results, use with Glyco-Guard, or as directed by your skin care professional.